The forms can also be used by those involved in training and bring an element of realism to simulated casework exercises. The forms will significantly enhance the experience of students and their trainers in their work. 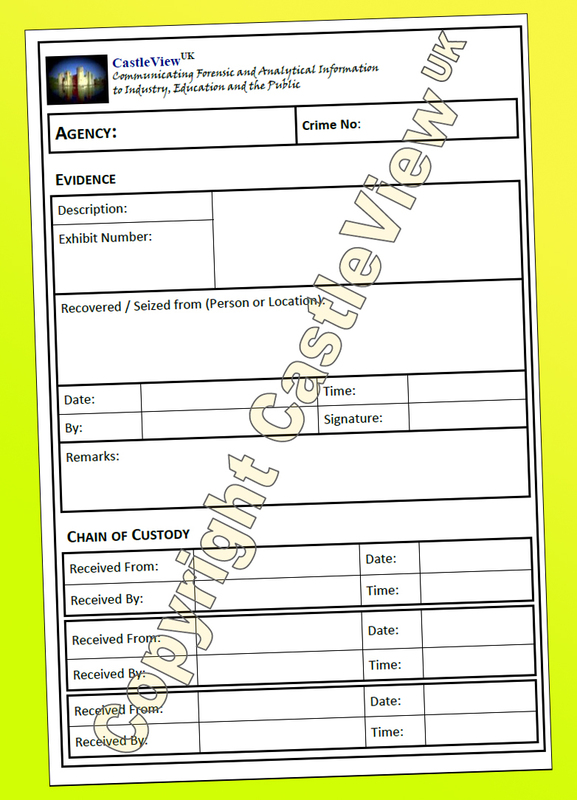 Our Crime Scene Examination Forms, Evidence Labels, and Evidence Submission Forms can be used to record the systematic examination of crime scenes, the collection of evidence from them, and the submission of evidence to the police store or forensic laboratory. They are essential to maintain the "continuity of evidence" in real casework. 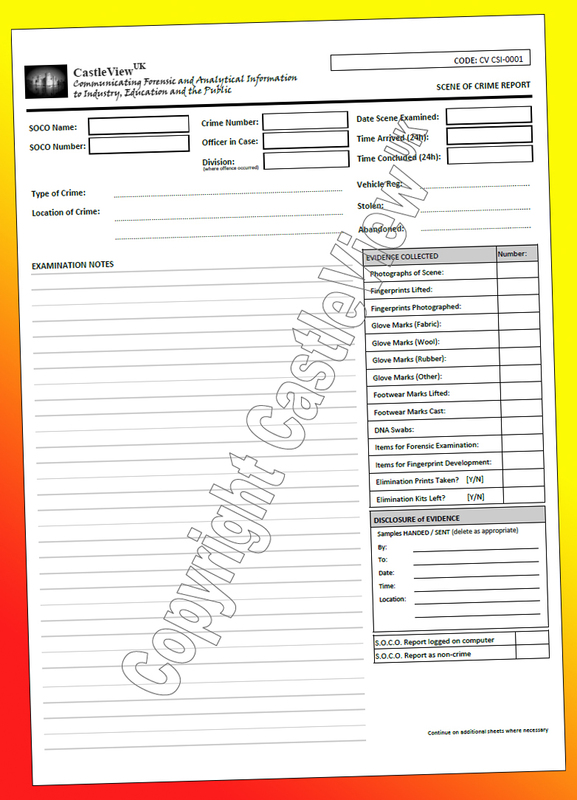 Our Crime Scene Examination Form can be used to record the systematic examination of crime scenes. They are are a vital part of the "train of evidence" in real casework, and can be used in training to add realism to any crime scene or forensic project or course. Our Evidence Labels (15 x 10 cm) detach easily from their crackback backing sheet, are self adhesive and will permanently attach to most clean, dry surfaces. There are 4 labels to every sheet. Our evidence labels allow you to record all the important facts regarding items of physical evidence recovered from crime scenes. Attached to the packaging of recovered items, their use is an important part of the "train of evidence" in real casework, and can be used in training to add realism to any crime scene or forensic project or course. Our Continuity Labels (15 x 10 cm) detach easily from their crackback backing sheet, are self adhesive and will permanently attach to most clean, dry surfaces. There are 4 labels to every sheet. These Continuity Labels allow for the sequential recording of the name of every person who takes possession of the item of evidence, and the time and date that possession took place. Their use is an important part of the "train of evidence" in real casework, and can be used in training to add realism to any crime scene or forensic project or course. Our Evidence Submission Forms are used to convey precise details of both case background and the physical evidence for submission, to the forensic laboratory which receives them for examination. 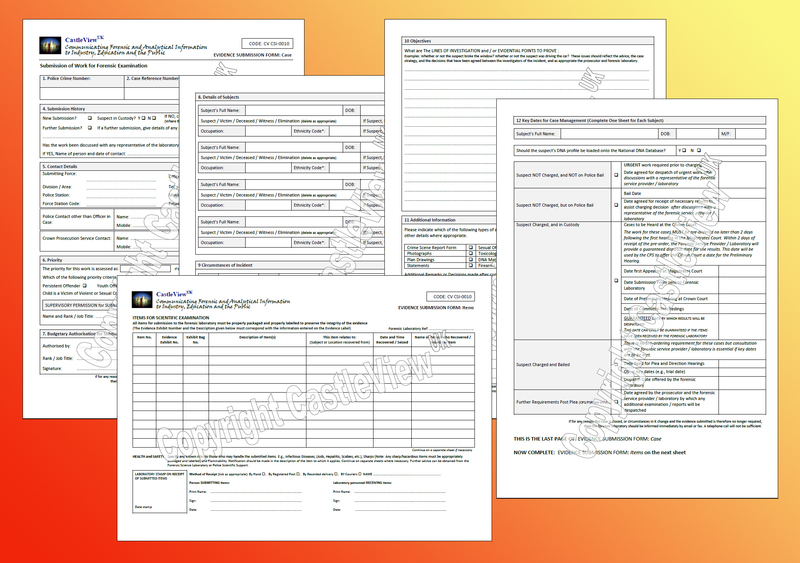 The 5-page forms are a vital part of the "train of evidence" and "Authorisation for Work", and and can be used in training to add realism to any crime scene or forensic project or course.